E. Bagshaw (University of Cardiff, UK) listening for the bleep from a wireless sensor buried in the snow a few hundred metres away. [Credit N. B. Karlsson]. When working in the middle of an ice sheet, you rarely get to experience the amazing wildlife of the polar regions. So what are we doing hundreds of kilometres from the coast with an animal tracker device? We are listening to the snow of course! It is not crazy; It is what Image of the Week today is all about! 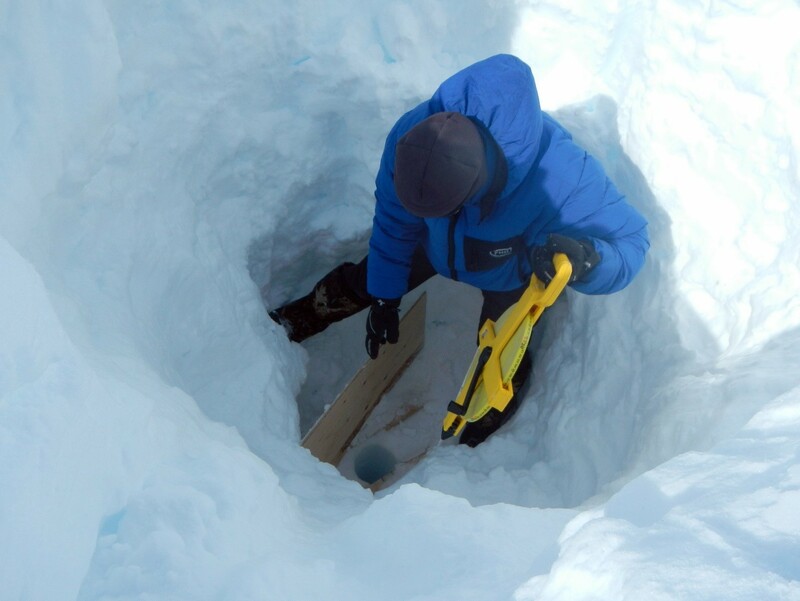 E. Bagshaw testing the range of an ETracer in a 12m borehole at the bottom of a 2m deep snow pit. [Credit: N. B. Karlsson]. In June 2016, Liz Bagshaw and I travelled to the EGRIP (East Greenland Ice Core Project) camp to test a handful of wireless sensors named “ETracers” in a new setting. The “wireless” part is very important, because it means that we can make measurements without having to connect our instrument to a cable, which may fail or snap. Instead, the sensors transmit all their data as radio waves. 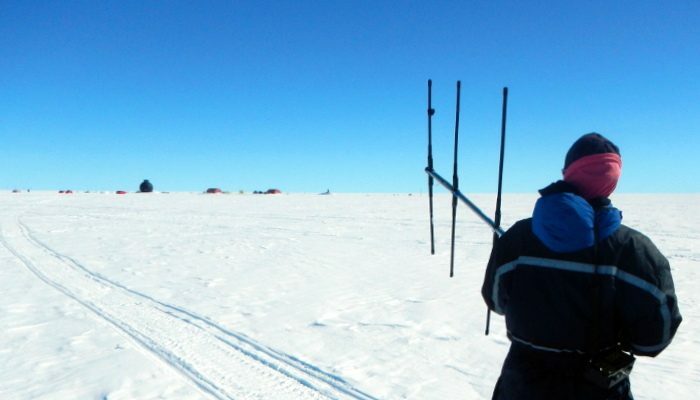 We use the same frequency that biologists use for tracking animals – although there weren’t many to see in the middle of the Greenland Ice Sheet! The ETracer sensors were originally developed for measuring the meltwater under the ice at the margin of the Greenland ice sheet. We wanted to test if they could also tell us something about what is going on in the snow. For example, how does the snow temperature change and how is the snow compacting in different parts of the ice sheet? These questions might seem theoretical but their answers are important when working with data from satellites, since the satellite measurements may be affected by different snow conditions. The ETracers stacked on small magnets. This temporarily stops their bleeps bleeps and is an efficient way of silencing them while we are listening for other ETracers [Credit: E. Bagshaw]. 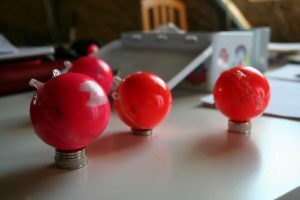 Armed with an antenna (see image of the week), radar receivers and what looked like small pink plastic baubles we set to work. The pink baubles are in fact the ETracers – small devices that contain temperature, pressure and conductivity sensors. First, we used a 60m deep borehole that was drilled earlier in the season. In order to test the range of the Etracer we lowered one to the bottom of the hole. We set up the antenna and receiver at the surface, and started listening for the ETracer signal. We were very pleased when the Etracer sensor happily chirped back informing us that it was below -30 degrees C at the bottom of the hole. Our colleagues had also drilled several 12m boreholes for us, and we now installed ETracers at the bottom of the holes as well as on the surface. For over a month, the ETracers sent back information to our receivers on the ground about temperature, pressure and conductivity of the snow. We are still analysing our data but the most important part of our work is done: we have shown that the ETracers can accurately measure the properties of the snow. Next year, we will return to the camp and set up more experiments. Stay tuned – or rather keep listening! You can read more about setting up the EGRIP camp in a previous Image of the Week post “Ballooning on the Ice“. Ice streams discharge approximately 90% of the Antarctic ice onto ice shelves , and ultimately into the sea into the sea (Bamber et al., 2000; Rignot et al., 2011). Whilst flow-speed changes on annual timescales are frequently discussed, we consider here what happens on much shorter timescales! Previous studies have shown that ice streams can respond to ocean tides at distances up to 100km inland (e.g. 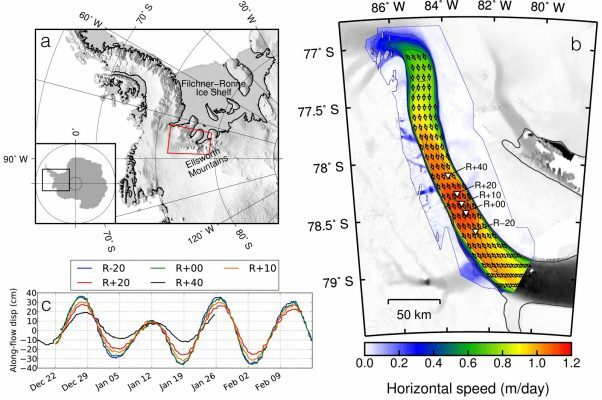 Gudmundsson, 2006 ; Murray et al., 2007; Rosier et al, 2014); new high-resolution remotely sensed data provide a synpoptic-scale view of the response of ice flow in Rutford Ice Stream (West Antarctica), to ocean tidal motion. These are the first results to capture the flow of an entire ice stream and its proximal ice shelf in all three spatial dimensions and in time. The ice-ocean interface is very important as nearly all ice-mass loss occurs directly into the ocean in Antarctica (Shepherd et al., 2012). Many areas terminate on ice shelves (the floating ice that connects with the land ice), which are fed by the flow of ice from the ice sheet. Any changes to the floating ice shelf alter the forces acting on the grounded ice upstream, therefore directly affecting the ice sheet evolution (e.g. Gudmundsson, 2013; Scambos et al, 2004). Because ocean tides are well-understood, we can use the response of grounded ice streams to ocean tidal uplift over the ice shelf to better understand how ice sheets respond to ocean-induced changes. Floating ice shelves are directly affected by tides, as their vertical displacement will be altered. These tidal variations are on short timescales (hourly to daily) compared to the timescales generally associated with ice flow (yearly). The question therefore is, how much can the tides affect horizontal flow speeds, and how far inland of the ice shelf are these effects felt? The movie below, by Brent Minchew et al, shows the significant response of Rutford Ice Stream and its ice shelf to forcing by the tides. 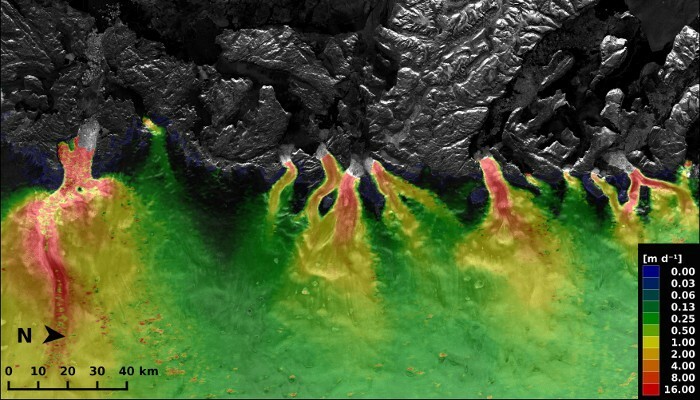 Using high-resolution synthetic aperture radar data they are able to infer the significant spatio-temporal response of Rutford Ice Stream in West Antarctica to ocean tidal forcing. The flow is modulated by the ocean tides to nearly 100km inland of the grounding line. These flow variations propagate inland at a mean rate of approximately 30 km/day and are sensitive to local ice thickness and the mechanical properties of the ice-bed interface. Variations in horizontal ice flow originate over the ice shelf, indicating a change in (restraining force) over tidal timescales, which is largely attributable to the ice shelf lifting off of shallow bathymetry near the margins. Upstream propagation of ice flow variations provides insights into the sensitivity of grounded ice streams to variations in ice shelf buttressing. 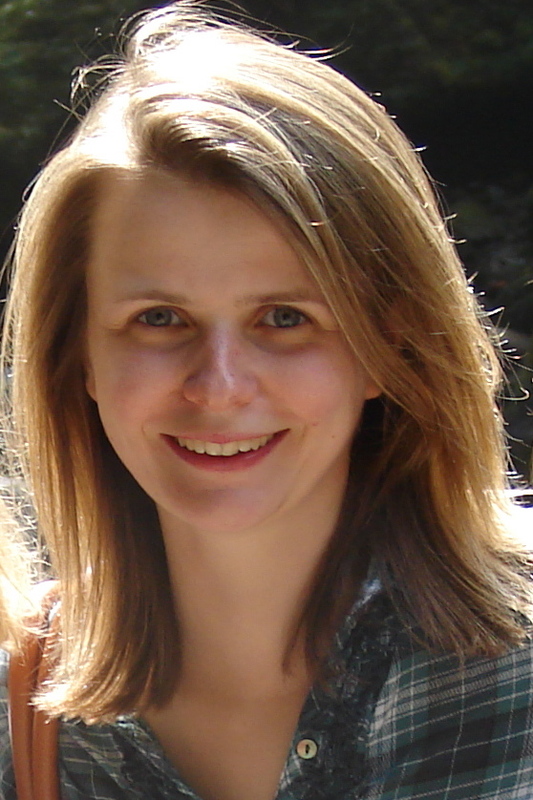 Teresa Kyrke-Smith is a postdoctoral researcher at the British Antarctic Survey, on the iSTAR grant. She works on using inversion methods to learn about the nature of basal control on the flow of Pine Island Glacier in West Antarctica. 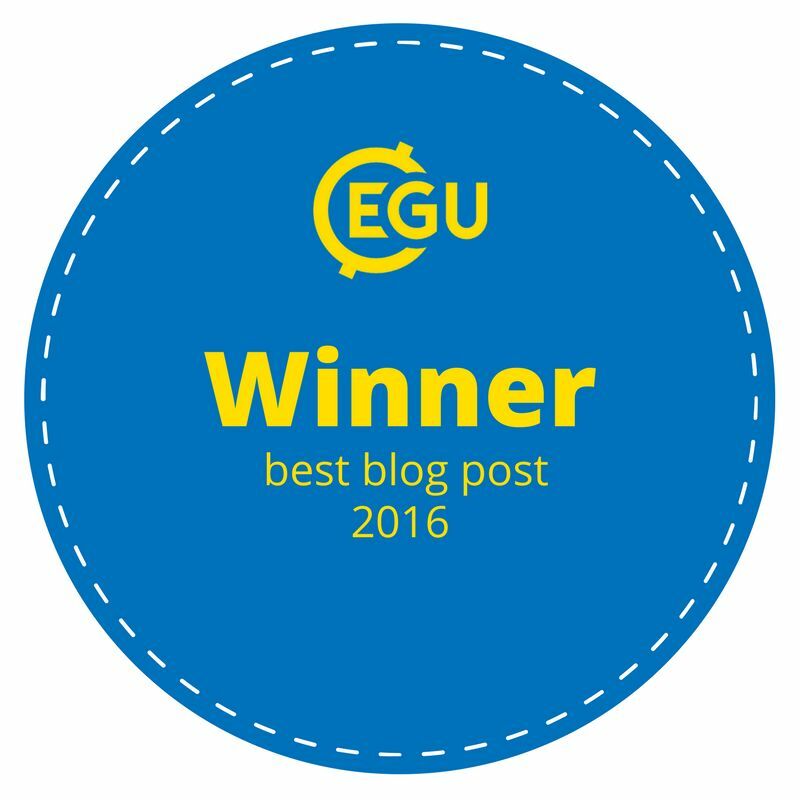 She completed her PhD two years ago in Oxford; her thesis focused on the feedbacks between ice streams and subglacial hydrology. Brent Minchew is an National Science Foundation Postdoctoral Fellow also now based at the British Antarctic Survey.